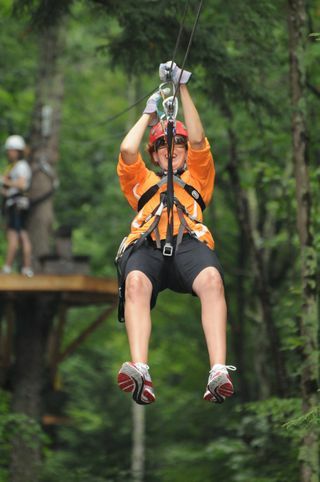 There are some great overnight trips in the Berkshires. Lastmonth we started ours at the newly renovated White Hart Inn in Salisbury. They have a fantastic new chef and we had a wonderful dinner on a balmy summer night on the porch while we played rummy 500 with ours boys (I won). Cant wait to get back there. The next day we drove up to the Clark Museum in Williamstown, MA. This is a surprisingly stunning museum and the architecture and surroundings are as interesting as the art. There are also many nature trails and a chic restaurant, so make sure to leave enough time to wander about. We wished we had more time there. Then we took a beautiful drive over a big mountain and arrived at our zipline adventure! As I am fearful of heights, I was really looking forward to this.(not). A training session proved that I needed 3 trys to figure out the braking while my husband and 10 year olds had it down in one. A 15 minute 4 wheel drive adventure brought us to the top of the mountain. When we arrived at the first platform, one of my sons broke out in tears and had to have the 4 wheeler come rescue him. I assured him I probably wouldnt make it the whole way and would meet him at the bottom soon. But once you get started, its a lot of fun! I made it the whole way, and I can now check zip lining off my list. 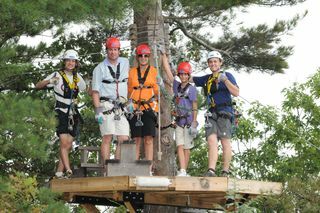 Visit: Deerfield Zipline for more info. Then on our ride back we stopped in the charming town of Northampton. What a fabulous place, so chic and lively. We shopped around in their great local boutiques and had a nice (but not memorable) dinner. It was only 1.5 hours back from there.